Qualcomm is readying its next big thing for 2015, the Snapdragon 820 processor, which will be the first to take advantage of the company’s own custom cores dubbed Kyro. Word on the street has been saying that we should expect to see the first devices bundling the architecture arrive into the wild sometime in the early months of 2016. 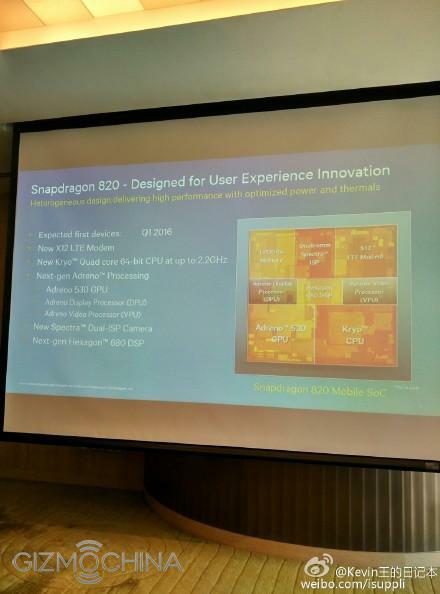 The information has only been speculative, but this week Qualcomm hosted a press event somewhere in Asia in order to detail the upcoming Snapdragon 820 some more. And a few slides from the presentation leaked online via Weibo (picked up by Gizmo China), revealing interesting details. One of them in particular confirms that the first devices arriving with a Snapdragon 820 processor will make it out in Q1 2016. So far, we’ve been hearing that the first handset to pack Qualcomm’s next-gen platform will be the Xiaomi M5 Pro. Well, it appears that the standard Xiaomi Mi5 will be powered by the same chipset. Or maybe the Chinese company will not unveil two models, but just one. According to the rumor mill, the phone should have been unveiled a month ago, but Xiaomi has been holding off for some reason. Although, if the flagship is set to launch with the Snapdragon 820 on board, it’s understandable why we haven’t seen the device make a debut in the wild until now. On the other hand, Samsung has also been rumored to be intensely testing the Snapdragon 820 for its upcoming Galaxy S7 flagship. According to current information, Samsung might be looking to get the Galaxy S7 ready ahead of schedule, like it did with its Galaxy Note5. Unlike previous years, Samsung will apparently not make its next-gen flagship available at MWC 2016, but a few days before the grand event in late February. Which makes sense given the Snapdragon 820 release timeline. The Snapdragon 820 is expected to be quite a silicone piece, coming with a new X12 LTE modem, quad-core 64-bit CPU with 2.2GHz clock speed and next-gen Adreno GPU with Adreno Display Processor and Adreno Video processor. Qualcomm will also be incorporating Quick Charge 3.0, a new technology that allows smartphones to charge from 0 to 80% in around 35 minutes.